There are a number of occasions when you may need to cut tight curves or holes in sheets of metal or in tanks when adding pipes to a cold water cistern, for example. Quite a few different tools are available to cope with this type of job. The main ones are sheet metal cutters and nibblers, sheet metal punches, hole saws, and tank cutters. Sheet metal cutters and nibblers can be used for cutting irregular shapes and for cutting up big sheets, but they cannot cut holes less than 25 to 50mm across. The other tools mainly make round holes, and to use them you start by drilling a small pilot hole. Sheet metal cutters work by cutting a very narrow strip of metal (the width of the blade) out of the sheet, leaving a slot. When you squeeze the handles of the tool together, the cutting blade shears the sheet between two anvils, rolling the waste material up in a coil as you push the tool forward a bit at a time. Because they take only a little bite, they can be manoeuvred to follow quite tight curves. But as the handles provide a very limited amount of leverage, most sheet metal cut­lers do not work too well on thick, tough metals. Sheet metal cutters can also be used on other materials like plastic laminates. Nibblers work in a slightly different way – the cutter moves up and down per­pendicular to the sheet. Takes a very small bite out of the sheet, then advances and takes another bite. Many nibblers are operated by hand, but some can be attached to an electric drill. When you use nibblers you can change direction very easily and cut quickly, but it is difficult to get a completely straight edge. When using either nibblers or sheet cutters a strip of metal is lost always cut on the waste side of your marking-out line. Sheet metal punches have three parts a punch which makes the hole, a die which supports the metal on the other side, and a bolt. They are easy to use and cut very clean holes, but access is needed from both sides of the material being worked on. To use a sheet metal punch, you drill a pilot hole for the bolt, pass it through the die, through the hole drilled in the sheet, and then screw it into a threaded hole in the punch. By tightening the boll (usually with an Allen or hexagon key), the punch is slowly pulled through the sheet into the die, leaving a very neat hole. They are available in a variety of sizes and shapes but they are not suitable for curved surfaces, since the die tends to flatten the area around the hole. Hole saws usually look rather like a piece of a saw blade bent into a circle, with a drill bit at the centre of the circle. The hole cut by a hole saw is not as clean as one made by a punch, but hole saws need access from one side only and can be used on curved surfaces. Most hole saws are a fixed size – the stated size may be the size of the hole it cuts or the size of the pipe titling or con­duit the hole is meant to take. 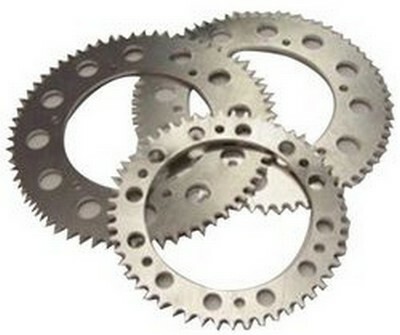 There are also multiple saws available which have a number of blades – you simply remove those which are not required. Tank cutters are mostly rather like hole saws. They also turn about a central twist drill and cut a circular channel at a set distance from it. But they should be turned more slowly than a hole saw – in a carpenter’s brace – and usually have a single cutting edge. The distance of the bit from the drill can be adjusted. 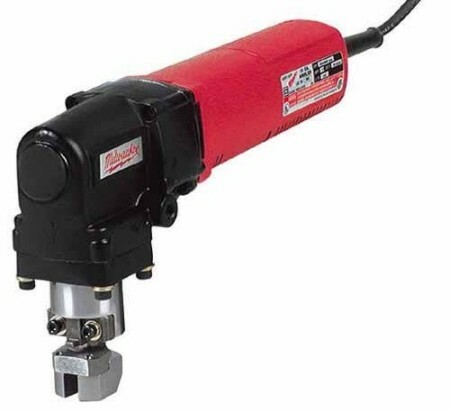 They are designed for cutting large holes in thin sheet metal. Some will cut holes up to 140mm in diameter, though 100mm is more common. If the blade is kept sharp, they can be used successfully on plastic laminate. A tank cutter is quite easy to use once you get the knack the cutting bit should be directly below the brace handle or should lag slightly behind it – but it is hard work. Be careful when the bit starts to break through and do not force it. If necessary, reverse the direction of rota­tion by turning the bit backwards. This type of tank cutter can be sharpened on a grinding wheel. If you want to make a largish hole in sheet metal (or, for that matter, plastic, such as a soil pipe or new cold water cistern) and do not have a specialist hole cutter, chain drilling is the answer. After marking out the circle to be made, a series of small holes are then drilled out around the circumference, keeping inside the line, and the disc is then pushed or cut out, finishing off the ragged edge with a file. With a soil pipe, avoid letting the disc fall inside.